Seeing an Alfred Hitchcock film for the first time is always an exciting experience. Last year, I witnessed a handful with fresh eyes, including the fantastic Vertigo and Psycho (both for this project). For this year’s project, I included another of his most highly-regarded films: Notorious. Released in Hitchcock’s first decade in America, Notorious is a post-war thriller with film noir elements that also happens to provide one of cinema’s most intriguing love stories. Cary Grant stars as T.R. Devlin, a secret agent who is an important figure in a plan to infiltrate a Nazi organization that has relocated to Rio de Janeiro. In order to do so, the government enlists the help of Alicia Huberman (Ingrid Bergman), the daughter of a convicted Nazi spy. While privately against the Nazi beliefs, she still has ties to those in Brazil, and she is sent to seduce their leader, Alex Sebastian (Claude Rains). Her commitment to the job is unparalleled, but there is a wrench in their plans: Devlin and Alicia fall madly in love with each other. This love triangle leads to some tense moments, as Alicia is asked to do things that were not part of the original plan. She is also tasked with riding that delicate balance between acting in love with Sebastian while still attempting to discover intel about the Nazi operations. Devlin does his best to remain detached, trying not to mix love and his work, and never flat out saying “I love you.” But when your love interest is Ingrid f’n Bergman, it’s hard to stay in check. There are several noteworthy scenes in Notorious, including many that rank amongst Hitchcock’s most suspenseful. One unforgettable sequence happens at a huge party at the Nazi headquarters. Alicia has stolen a key to the wine cellar, where she is to lead Devlin in hopes of uncovering a secret to the organization’s operations. Everything is going well until the hosts begin running low on alcohol upstairs. Sebastian and an associate start heading downstairs at the same time Devlin and Alicia are investigating the cellar. The suspense builds as the chances of a successful escape grow very slim. The film’s conclusion is also thrilling, including one of the slowest descents down a staircase that I have ever seen. Despite being nearly 70 years old, Notorious holds up remarkably well today. The story, while taking place shortly after World War II, is a timeless tale of espionage and romance. 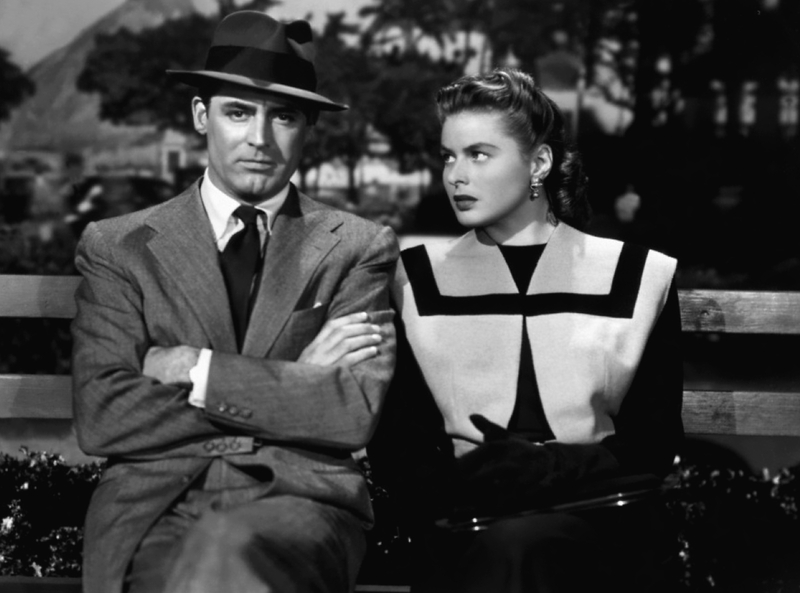 Cary Grant and Ingrid Bergman are a fantastic pairing, two gorgeous Hollywood A-listers with strong chemistry. Claude Rains adds a great deal to the film as well, delivering a performance that somehow makes the audience sympathize with the plights of a Nazi. 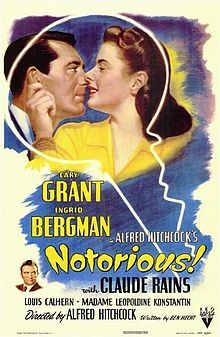 It’s a bit shocking that Notorious only received two Oscar nominations: Best Supporting Actor (Claude Rains) and Best Original Screenplay (Ben Hecht). Then again, Hitchcock’s lack of support from the Academy is well-known (he never won for Best Director). Regardless of these oversights, Notorious ranks among his best work, and it is easily one of my favorites from this year’s project. This deserves to be mentioned when others talk about the director’s more popular and critically-acclaimed work (i.e. Psycho, Vertigo, Rear Window, etc.). Isn’t this the movie with the infamous ‘kiss’ scene that is very intimate while they never really kissed longer than the censors would allow? This is one of my favorite Hitchcock films that I think too often gets forgotten among his best (Vertigo, Psycho, North by Northwest, etc.). 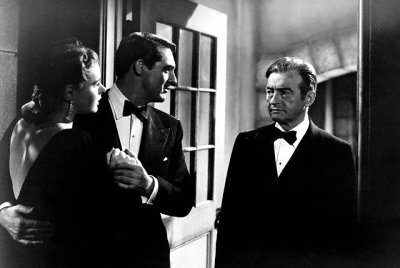 Love this pairing of Cary Grant and Ingrid Bergman, along with the wonderful villainy of Claude Rains. Well done. I agree with you 100%, Michael. It’s odd that this is such a highly-acclaimed film, yet one that is often overlooked when talking about Hitchcock. It’s certainly up there for me. I’m a huge Notorious fan and rank it #2 among Hitchcock films, right behind North by Northwest. I’m glad you enjoyed it! Nice! It’s probably in my top three or four as well. It’s crazy to think that Hitchcock made several films of this quality — Notorious would be a clear-cut #1 for so many other directors. Great review! I agree it’s a great movie and it stands the test of time very well. Whenever I think about how Academy treated Hitchcock’s movies I just can’t believe it. I mean Psycho wasn’t even nominated for Best Picture – that is one of the most ridiculous things in Oscar history. Yeah, the Academy’s lack of respect for Hitchcock is mind-boggling. I think a list could be made out of that very topic — top 10 ways Hitchcock was snubbed at the Oscars! Gah, I still haven’t seen this one and Vertigo!! 9/10 huh, ok better get on this one pronto! This one’s got it all, Ruth! Cary Grant is in prime form here, and I seem to remember you being a fan of him. Absolutely a must-see. Grant and Bergman are great, but Claude Rains is the standout performance here. Very nuanced villain. Absolutely, man. Claude Rains was fantastic — it’s not often a film is able to make its viewers sympathize with a Nazi (even if just somewhat). I agree that this would make an excellent introduction to Hitchcock, and it deserves to be mentioned in the same breath as his more popular work. Great post, the shot that zooms to the key in Alicia’s hand is an amazing use of a camera. Thanks, Vinnie. That is certainly a fantastic shot.